It was the spring of 1942 before General der Flieger Student could tackle the task of rebuilding his decimated airborne forces. The first formations were returning from the East, where they had been badly battered. Von der Heydte's battalion was sent to the Döberitz-Elsgrund Training Area, where it was redesignated as an instructional battalion. Experiments were conducted with night jumps and descents on wooded areas. Efforts were also undertaken to allow the paratroopers to jump with their main small arm instead of having to retrieve one from a weapons container. Trials were also conducted starting in May of that year with a new generation of gliders such as the Gotha Go 242. There was a purpose to all of those efforts. Von der Heydte's battalion was earmarked for the initial assault on Malta, where it would jump into the British antiaircraft defenses six hours before the main body arrived and take them out of commission. 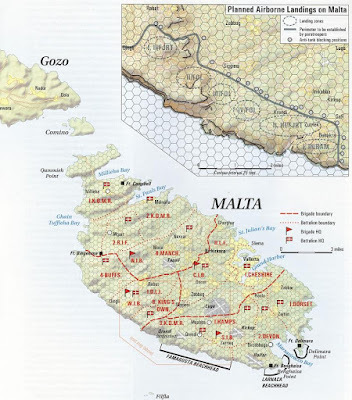 The attack plan for Malta and several other operations had recently been discussed in Rome. Generalfeldmarschall Kesselring had summoned Student to Italy's capital. Student saw Generalmajor Ramcke there as well, as the latter had been sent to Italy to help train that country's fledgling airborne corps. The airborne division "Folgore" and the air-landed division "Superba" were being formed and trained in accordance with German doctrinal principles. Together with Ramcke, Student worked out the first draft for an assault on the island fortress. In theory, command and control of the operation was under the Commander-in-Chief of the Italian forces, Colonel General Cavallero. By involving the Italians in this way, the Germans hoped to secure access to all of the Italian fleet to support the operation. 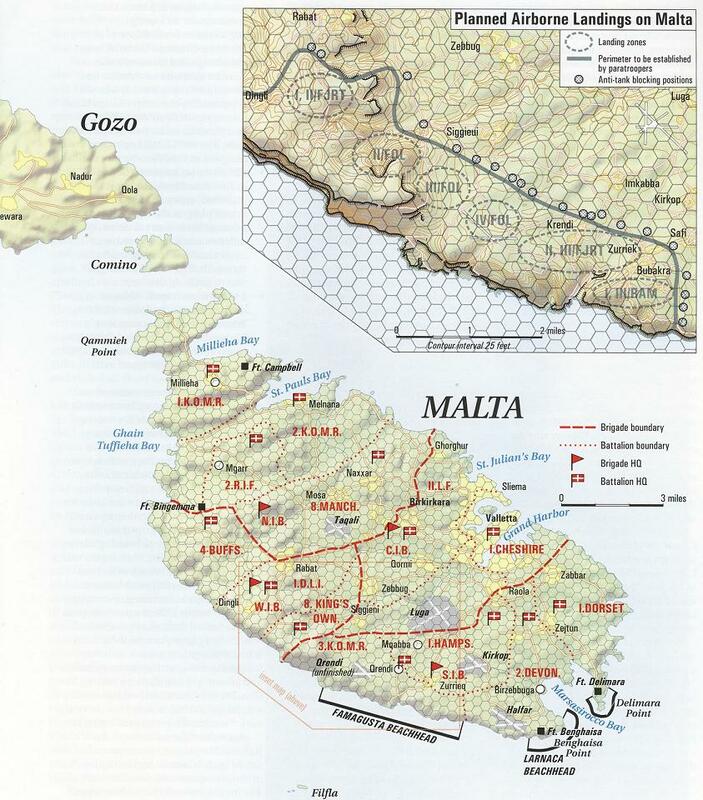 Part One: After a surprise landing by gliderborne forces from von der Heydte's battalion on the antiaircraft batteries of Malta and the subsequent elimination of them, the main body of the paratroopers and air-landed forces will arrive as the advance guard under the personal command and control of General Student to the south of La Valetta on the high ground there. It will establish a broad landing zone on the island and attack the airfields and city of La Valetta in rapid, decisive action. Part Two: Seaborne landings of the main body of the attack forces south of La Valetta, which will advance in conjunction with the airborne forces from that area. Part Three: In order to deceive the enemy and divert his attention, there will be a deception operation against Marsa Scirocco Bay. Part Four: The safety of the seaborne transports is the responsibility of the Italian fleet. The securing of the air space is the responsibility of Luftflotte 2. The formations of that tactical air force will conduct massed attacks on the airfields and antiaircraft positions on Malta prior to the airborne landings, defeat the enemy's air forces and paralyze the enemy's antiaircraft defenses. For the operation, 12 of the Gigant transporters were available for planning purposes. The Me 323 had six engines and were able to take a complete Flak platoon or 130 fully loaded soldiers in one lift. The operations received the codename Unternehmen "Herkules" and lived up to its name, both in size and ambition. The chances for success were good, better than those on Crete had been. The point of debarkation for the identified forces was Sicily. The II. Flieger-Korps of General der Flieger was earmarked to support the airborne forces. In addition, the entire Italian Air Force was designated to support the operations. Mussolini also promised the use of all of the Italian Navy, including its capital ships. The Italian airborne division "Folgore" was based in Viterbo and Tarquinia and under the command of General Frattini. Thanks to the help received from Ramcke, he was able to imbue the fledging Italian airborne force with true airborne spirit. The air-landed division "Superba" was also a formidable combat formation. In addition, there were four well-equipped Italian infantry divisions to be added to the mix. That was a force that outnumbered the one used to take Crete by many fold. In the middle of these preparations, a telegram summoned Student to the Führer Headquarters in Rastenburg. Student had just arrived, when Generaloberst Jeschonnek, the new Chief-of-Staff of the Luftwaffe, greeted him with these words: "Listen to me, Student. Tomorrow morning you'll have a hard audience with the Führer. General der Panzertruppe Crüwell from the Afrika-Korps was just here. With regard to the esprit de corps of the Italian forces, he had delivered a shattering verdict. As a result, the Malta Operation is in danger, since Hitler doubts the resoluteness and devotion of the Italians more than ever." Despite that, Student hoped to be able to convince Hitler. In front of a large audience, Student presented the final plans for "Herkules" the next day. Hitler listened attentively and asked a number of questions. When Student finished his presentation, Hitler aired his opinion. A torrent of words flowed from Hitler: "The establishment of one of the bridgeheads with the airborne forces has been assured. But I guarantee you the following: When the attack starts, the British ships at Alexandria will sail out and also those from the British fleet at Gibraltar. Then see what the Italians do: When the first radio messages arrive about the approach of the British naval forces, the Italian fleet will run back to its harbors. The warship and the transporters with the forces to be landed will both head back. And then you'll be sitting alone with your paratroopers on the island." Student was prepared for just such an objection. He stated: Generalfeldmarschall Kesselring has taken that eventuality into consideration. Then the English will experience what happened to them a year before on Crete when Richthofen came in and sank a portion of the Alexandria squadron. It will probably be even worse for the enemy, since Malta is within the effective range of the Luftwaffe. The air routes to Malta from Sicily are considerably shorter than those from Greece to Crete were. On the other side, the distances for the British naval groups are twice as far as those to Crete. Malta, mein Führer, can thus become the grave of the British Mediterranean Fleet. Hitler could not make up his mind. With the specter of Crete still haunting him, he vacillated. Malta most certainly should have been a priority in the larger sense, since the British 10th Submarine Fleet operated from the island, which was responsible for sinking so much Axis shipping bound for Africa. But, in the end, he decided against it, and even Student's assurances that even in the worst case the airborne forces could take the island all by themselves, because Malta had already been badly battered by the German aerial attacks. In the end, Hitler decided: "The attack against Malta will not take place in 1942." As a result of this decision, Hitler cancelled an operation that would have lent an entirely new face to the overall conduct of the war in the Mediterranean and would have decisively influenced the war in Africa in favor of the Germans.